I mentioned the other day that I was about 100 percent sure there would be at least one ACC head coaching opening this offseason, coming at Pittsburgh. I feel about as confident there will be at least two in the SEC. Ole Miss already is looking as the school and Coach Andy Kennedy have agreed to part ways after the season. Not sure Ole Miss can do better as Kennedy is the winningest coach in school history and led the Rebels to two NCAA Tournaments and two NIT Final Fours. Meanwhile, it's now clear that Georgia will miss the NCAA Tournament as the Dawgs are in a free-fall, and the school is expected to fire Mark Fox. Two names you already here at UGA are Tom Crean and Thad Matta. Both would be an improvement. American Athletic Conference game at 7 p.m. ET on CBS Sports Network. When the NCAA Tournament selection committee released its top four seeds in each region last weekend, Cincinnati was No. 2. I think UC would be a No. 1 if it were to get through this week unbeaten because after facing AAC second-place Houston here, the Bearcats host No. 19 Wichita State, the preseason conference favorite, on Sunday. Cincinnati brings a 16-game winning streak into this one, ending any bubble hopes of SMU on Sunday with a 76-51 blowout in Dallas. Kyle Washington had 17 points and eight rebounds in just 18 minutes. It was the most-lopsided loss by the Mustangs in their five seasons as an AAC member. The No. 5 ranking is UC's highest since the end of the 2001-02 season. It also leads the nation in scoring margin and is the highest-scoring team of the 12-year Mick Cronin coaching era. ESPN currently has Houston in the field of 72 as a No. 10 seed, and the Cougars probably would punch an at-large ticket for sure with an upset here. They won a third straight game Sunday with a 73-42 wipeout of Tulane. Sophomore guard Armoni Brooks was honored Monday as the league's Player of the Week. He had his first two career double-doubles last week. These teams met Jan. 31 in Cincinnati and the Bearcats rallied from an 18-point deficit to win 80-70. The Cougars fell to 0-16 on the Bearcats' home court and 2-30 overall against Cincinnati. Houston leading scorer Rob Gray was held to nine points on 4-for-15 shooting. Key trends: The Bearcats are 10-1 against the spread in their past 11 vs. teams with a winning record. The Cougars are 4-0-1 ATS in their past five at home. UC is 5-1 ATS in the past six meetings. The pick: Houston (I think wins outright). Big Ten Network game at 8 p.m. ET. Maybe the best coaching job in the country this season has been done by Chris Holtmann at Ohio State as this was expected to be a rebuilding season in Columbus when Matta was surprisingly fired this summer and replaced by Butler's Holtmann. Yet there the Buckeyes are leading the Big Ten over Michigan State and Purdue - OSU beat the Spartans and Boilermakers in the only scheduled regular-season meetings as well. The Buckeyes are playing for their first regular-season conference title since 2012 and their first outright league championship since 2011. Not bad for a team projected to finish 11th. The last time Ohio State was in the Top 10 of the AP poll was Jan. 6, 2014, when it was No. 3 in the country. That Purdue upset in West Lafayette was last Wednesday, and OSU avoided a letdown Saturday in crushing visiting Iowa 82-64. Andre Wesson started his third straight game for the Buckeyes while guard Kam Williams remains suspended indefinitely. Penn State's 18-9 overall record and 8-6 in the Big Ten looks nice, but the Lions aren't projected in the NCAA field right now thanks partly to an RPI of 84. Their only win over an RPI Top 50 school was Jan. 25 in Columbus, 82-79. 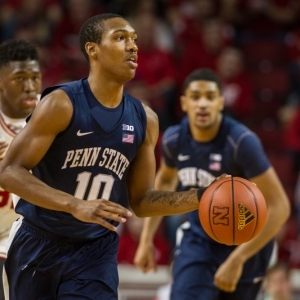 Tony Carr hit a bank-shot buzzer-beater from just a few steps inside half court for the win. Overall, PSU was 11-for-14 from deep, with the 78.6 percent success rate the best in program history. Key trends: The Buckeyes have covered five straight on the road. The Lions are 5-1 ATS in their past six. The road team is 4-1 ATS in the past five meetings. Pac-12 Network game at 9 p.m. ET. No. 17 Arizona at No. 25 Arizona State is the game of the night in the Pac-12, but both the Wildcats and Sun Devils are going to be NCAA Tournament teams regardless of what happens there. The Utes and Huskies, meanwhile, are very much on the bubble, so a head-to-head victory could prove huge. ESPN's bracketology has Washington among its "Last Four Byes" and a No. 11 seed in the Big Dance. Utah is among the "Next Four Out." The Huskies have an RPI of 44 and the Utes 59. UW lost at Utah on Jan. 18, 70-62. Starting Utes point guard Justin Bibbins played through the flu and had 20 points and 10 rebounds. Neither team shot better than 38.5 percent. Utah just swept the Bay Area schools last weekend in Salt Lake City in impressive fashion, first beating Stanford by 15 points and then Cal on Saturday, 77-43. Utah had 24 assists on 28 buckets vs. the Bears, who shot just 16-for-53 from the field. Utah also honored its 1998 Final Four team at halftime vs. Cal. Washington is trending the other way as it was swept at the Oregon schools last weekend, 65-40 at the Ducks and then 97-94 in double overtime at Oregon State on Saturday. Stephen Thompson Jr. hit a 3-pointer with 0.3 seconds left in double OT. Noah Dickerson led UW with 28 points and 12 rebounds, becoming the 38th player in school history with 1,000 career points. Key trends: The Utes are 4-0 ATS in their past four after a win. The Huskies are 5-1-1 ATS in their past seven. Utah is 5-1 ATS in its past six trips to Seattle. Want free sports betting picks? Doc's Sports has you covered - get $60 worth of picks free from any of Doc's Sports expert handicappers. Get $60 worth of premium members' picks free .